I have just emailed Euterpe and got a replyin seconds. the young woamn at the back with long dark hair is Sabina Stewart but she doesn't know who the blonde is. englishangel wrote: I have just emailed Euterpe and got a replyin seconds. the young woamn at the back with long dark hair is Sabina Stewart but she doesn't know who the blonde is. I wondered just from the hair if it was Sabina Stewart, but the face didn't look the same. Mind you, the seniors always looked so grown-up to me when I was a junior, whereas now, in the photo, everyone looks so young! 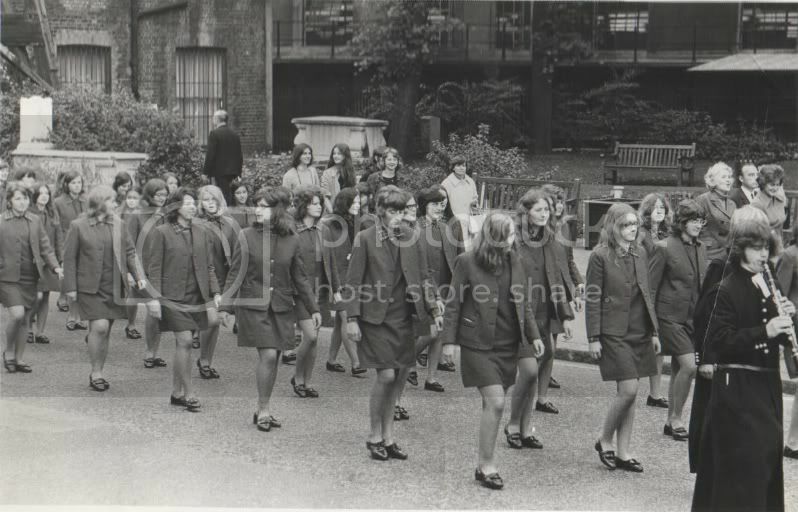 Hi - been going squiffy-eyed trying to work out who the dark-haired girl is with Sabina , but realise might not be an OB at all - at the time we were both at the French Institute ( she must have bunked off a class...!) so could also be someone from there - idem for the blonde, who I recognise but to whom I cannot put a name. I thought the dark haired person with Sabina was a man - I assumed, her boyfriend. Ahem, I think the person with short dark hair is actually of the male persuasion, that was my initial thought anyway. Ah, while writing this Jo had the same thought. It's still here, in the middle of page 2. The picture you are disallowed to see is from 1971. I can see it but I will repost. I am the girl in the middle with my jacket buttoned up looking to my right.